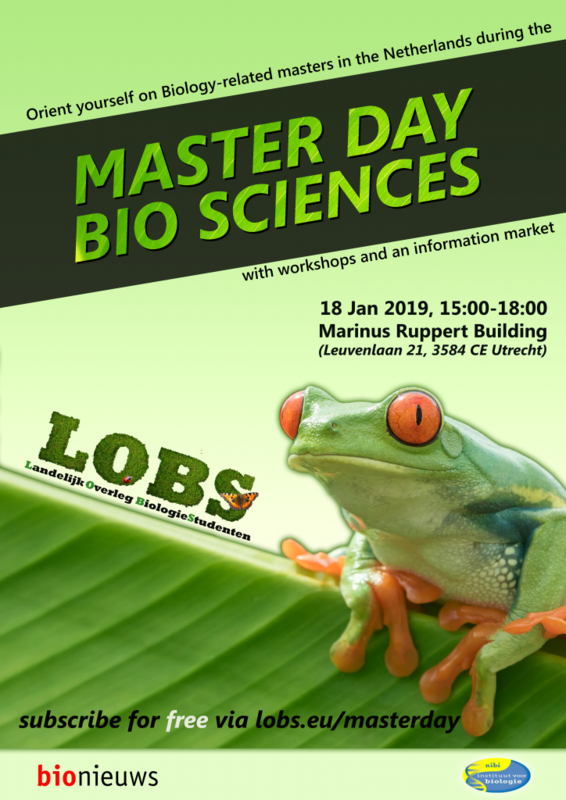 On Friday the 18th of January 2019, the National Master Day Bio Sciences 2019 will take place, organized by the LOBS (Landelijk Overleg BiologieStudenten) in collaboration with the Dutch Institute for Biology (NIBI), Bionieuws, and various Dutch universities. There will be an information market from 15:00 until 18:00 in the Marinus Ruppertgebouw at the Uithof in Utrecht (Leuvenlaan 21). Master programmes from all over the country will present themselves during an information market, where you have plenty of opportunities to browse and ask all the questions you may have. In addition, interesting lectures about the labour market or how to choose your master will be organized. It is important to orient yourself in time in order to make the best choice for a master, therefore this activity is interesting for not only third-year bachelors, but also second and even first year students.